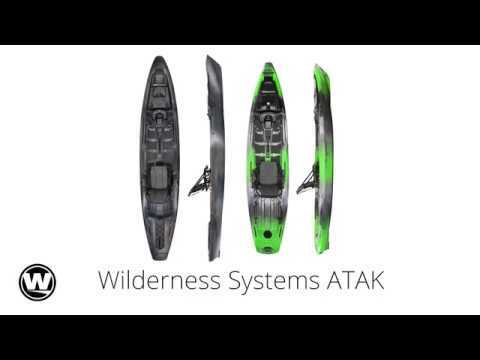 The Wilderness Systems ATAK 140 - Advanced Tactical Angling Kayak - is taking the kayak angling world by storm. It features an open design that can be customized to meet the needs of almost any angler. The deck is highly walkable and stable - a feature that was achieved without needing to add more width to the boat, allowing for sustained speed and glide. The deck is low-profile and intentionally designed to shed wind. Storage opportunities are abundant and are thoughtfully located throughout. It will also feature the new AirPro MAX seat which becomes even more versatile with the ability to travel the majority of the length of the deck. The ATAK is highly adaptive boat that can fish any environment and target species. Limited number of 2018 closeout colors available, price applies only to stock on hand. UPDATE*** I ended up buying a second ATAK at a deal I couldn't pass up. This time, I purchased a 2016 model in sunset orange. I have been taking the ATAK in lakes, rivers, and saltwater bays for over a year now. I have not had a problem with more than a few cups of water getting into the rod staging area. I am unsure if there are any major differences in build between the 2015 and 2016 models, but I have not ( so far ) had any bad or scary experiences with this ATAK ( such as taking water into the hull a mile from shore from large waves and heavy rain) like I was having with the previous model. I would recommend this kayak to anyone who wants to fish a solid, customizable, stable kayak. Pros: This kayak was seemingly everything I ever wanted. It tracks very well ( slight lean to the right as people have mentioned, but it's not a big deal to me), it's incredibly sturdy. I am 270 lbs and have very large and wide feet and this kayak is very easy to stand up on and hang off of the side. The geartracks are incredible. I love being able to add anything I want on virtually any part of the kayak without drilling holes. SUPER CLUTCH! I love the flex pod. Great design for a fish finder. Absolutely an amazing kayak for sight fishing on lakes and ponds. Also, the predrilled holes in on the face of the stern are absolutely perfect for customizing an anchor setup or using an anchor wizard, even though it's not meant for that purpose. I imagine that mounting a power pole or a trolling motor would be very easy. The deck mat that comes with the kayak are very high quality. I have stood up on this kayak countless times, and have never expereinced any slippage. The seat is very comfortable. The straps loosen throughout the day, but it's really easy to tighten them even when seated. The low-profile makes it much easier to paddle into the wind. One may say, " it's a breeze..."pardon the pun. Also, the front and rear carry handles are fantastic. Even my tiny girlfriend can carry this boat with me with little stress on her hands and wrists. It even comes with built in paddle straps so you only have to buy one if you want to be fancy. Now for the Cons: There are some major design flaw with this kayak. To me, had I known the issues, I would NOT have purchased this kayak for such a large amount of money. The biggest flaw is the rear hatch. It is NOT waterproof in any way, shape, or form. I was told that the ATAK 140 is sea-worthy, and can be paddled beyond the breakers. Stability wise, this kayak can handle 4 foot swells with the best of them, however, the second water starts hitting the rear hatch....your hull fills with water....WHAT?????? That's a pretty big design flaw for an $1800 kayak. If you are a person that paddles in big water, you're going to want to waterproof this hatch before you get out there. My hull filled up on big water, and if I didn't notice, who knows what may have happened.... The water caused the kayak to gain seemingly about 200 lbs of weight and dragging the boat out of the water felt like I was deadlifting 315lb in the weightroom. Besides that, the dry sack in the middle of the deck is not 100% waterproof as well, although it's not terrible either. You wont be able to access the front hatch while on the kayak due to the design, so anything that's a fishing necessity needs to be kept under your seat or in the rear well. The carry handles on the side are, in my opinion, in a terrible spot to carry the kayak by yourself evenly without dragging it. Other than previously stated, there's not much else wrong with this beautiful looking boat. My Conclusion: If you are an angler that fishes on slow moving water or glass ponds, this kayak is incredible, and for you, I'd give it 4 stars. If you are an ocean fisherman, or fish in waters that can have large waves crashing down on your boat, I would steer clear of this kayak, unless you are handy and can figure out a way to 100% waterproof your hull. But if you are looking for a boat that can handle crashing water without worry...I give this boat 2 stars. Overall rating of 3 stars because I'm scared to take the boat on any body of water that may cause it to sink or be stranded due to water intake ( 2 star rating), but this boat is everything anyone could ever want when paddling on calm lakes and ponds. ( 4 star rating). Beautiful, sturdy, customizable kayak, with one major design flaw, and a few smaller design flaws. I bit hard when I learned of Wildy releasing the ATAK. For flats fishing I felt like this was going to be the ultimate, as I was coming from a JK Big Rig. Sleek, low low profile, tracking, potential of a pedal system, 3D seat, Rod storage, big hatch, etc. I bought it immediately, thinking this kayak was apart from other paddle yaks. First couple trips, i noticed I kept tracking/drifting right. Researched it, found others too were having same issues. The recommendation, center seat and zip tie it. Zip tie the seat to stabilize it as it had a bit of play which caused it to drift. Zip tie it...hmmm..not what I wanted to hear after dropping $1800. The seat is OK, I always found myself having to readjust the straps during a trip. The center hatch, couldn't access it based on my seat position. Water is always in the hull, always. Figured it came from the rear storage unit hatch. If I didn't have water in it and just rinsed off the yak, water was in the hull. I knew there was a problem when I loaded up the night before, a short moderate rain occurred for 30 minutes while driving to the marsh. Began to unload and it weighed a ton. Water inside hull. The inside recessed handles are useless. And the other issue, the floor was always wet. Even if I had a few scuppers in, water was always present. It's a big kayak and loading onto a bed extender was challenging due to overall size and weight of it. I did like the stability of the kayak. Compared to paddling to a JK Big Rig, the ATAK is easier and it does glide well....to the right though. Its. Ok. Thats about what I can say about it after fishing a few weeks out of it. I have a thresher 155 and as a pure fishing boat.. the thresher.. thrashes the atak. The only reason I'll be using the atak 140 is in very clear water, slow moving water, where i will be sight casting and/or fly fishing. First the Positives... 1. The seat. Its awesome. really comfortable 2. You can stand up in it. I bought the accessory raised seat you can lean back on. Thats great too. I can stand up regularly or lean back on the raised seat, no problems. Even with my miniature pincher moving from side to side.. stability is not an issue (though it might be in fast water) Thats about it for the pros. Cons (and Im comparing it to my thresher 155) 1. Storage. it blows. That hatch in the back is silly and I think it was put on as an after thought to place rods in it. The bow hatch has had water in it every time ive fished it and I dont know how.. the creek flow is maybe 1 mph or less. The bow hatch in my thresher 155 has never had water in it. The only place to really put anything in reach while fishing, is in the flex pod. the round hatch under the seat you can almost never reach anyway. So the front is always littered with a small box of lures, trout net etc. On the other hand, the thresher storage (with the added drop in bin for the center hatch and the webbing by the seat).. is OUTSTANDING. 2. Speed. compared to the thresher its a Dog. It is wider and meant to stand in..but its a lot slower and takes a LOT more effort to keep moving. Ive paddled my thresher for miles and never even felt it in my shoulders. I paddle the atak 140 for a mile and my shoulders start feelin' it. 3. rudders. dont know why but the rudders on my atak are harder to keep straight than on the thresher. its ok.. if you HAVE to stand up.. this is a good kayak. The seat is also awesome. If they could put that seat in the thresher it would be amazing. So as it stands.. I'll use the atak 140 when I want to fly fish/stand up..and am not going far. otherwise I'll be in the thresher 155.. its just an all around far better fishing kayak. Just took my new ATAK 140 out for it's first all day fishing trip. I was left very impressed. It averaged 3.5-4 mph easily with normal gliding effort, was very comfortable to fish from. Fir the first time I ended the day without my hamstrings and hips being tight and sore. I was able to easily stand from either the low or high seat position and I'm a 6' 270 lb dude. Standing took some practice to get my balance and sea legs going (my balance issue, not the boats), but by the end of the day I was standing and fishing without thinking too hard about it. This Yak is very stable for it's size. It tracks really well on calm waters without the rudder, but when the wind picked to to whitecaps it wanted to turn into the wind so the rudder kit is now on my wish list since I tend to do larger lakes where the wind can be an issue. It handled the whitecaps great, I walked away dry for once. Plenty of storage, I can fit most of my gear for travel and storage in the hatches and a BlackPak. The rod holder storage was very nice, I didn't have to try to fit my rods in the truck or bungee then down. All in all I am very happy with my ATAK, I only wish I had gotten one sooner. The guys at ACK were great!! They answered all me repeated questions and helped me assemble and load it all up. It was a real pleasure doing business with them. Excellent Kayak I love my atak ! The only downside I feel is she is so light in the rear end she should come with a stock rudder. Having to purchase so many things separate is kind of limiting and breaks budgets. Best kayak on the market I think. ATAK 140... 6'3", 280 pounds and 47 years old... That's actually all you need to know to buy this Kayak. It's stable, yes I can stand up and sit back with a pull strap... it has a ton of room to move about and the seat is second to none. I can fish as long as I wish w/ no issues of comfort. Because of being tall and the width to go with it, I like that you need to put a little weight to the back to keep the nose from pearling into wake, just trim it out to your size and gear carried and go set the hook. To me,that just means to put the seat all the way back and You will have as stated earlier, A TON OF ROOM TO MOVE AROUND! The Harmony scupper plugs work perfectly and if you're smart when you're done, take the seat, pod (Humminbird 688) out and your crate and just pick it up by yourself and put it in you bed or place it on top of your racks, it's not that heavy. It takes longer to strap it down then it does everything else combined to pack up. Now... I don't see a little guy needing this yak. My 13 yo son whose 5'9" and 120 pounds does perfect on the Tarpon 120, I could see him having issues moving the ATAK around.... out of the water but not a single issue fishing. Now if you're want to shoot the rapids, obviously the wrong boat... for you ssmaller ladies and gentlemen. Perfect kayak! No issues with leaking, an once or two gets in... well we are on the water. And paddle wise, I use the Carlise Predator Angler 250cm.... It's too short, and was the worse mistake I made in this whole deal, which isn't bad for a new kayak fisherman. Get a minimum of a 270cm if your my size for low angle strokes to avoid getting wet, even though we are on the water. Lakes, Rivers and the Chesapeake Bay. She's a work horse. So I bought the ATAK a month ago. I have used it in 2 trips. So far, I like the ATAK, but it does have some issues. The Good: - It can hold my voluptuous (310lbs) body just fine and comfortably. I can even stand in it. While I only stood a couple of times and I am not quite used to it, this kayak is very stable even with a decent amount of weight. - The seat is super comfortable. My 2 outings were from 7AM-3PM and I sat in that seat without issues all day. - The utility pod is useful. I put a drink and pliers in there and I know where they are all day. - The fit and finish is nice. I feel like I got a quality boat and I know I did whenever I get in the thing. I like how the rudder lines were already run, which made the rudder install easy. - It takes the waves well. One of the trips I was on, had 3ft waves and 30MPH winds. The scuppers did their jobs and the deck stayed relatively dry. - It is a big boat and there is plenty of room for whatever you want to bring with you. The Bad: - The front storage pod, even with scuppers, is anything but waterproof. So don't put anything in there that you are not OK with getting wet. I didn't realize that prior to hitting a nasty stormy day. Luckily I only had a cooler in there. - The seat. Since the front deck rails are so long, I would have liked to see some kind of adjustable position along the rails. Similar to a car seat where i could pull a lever and slide it from the front of the deck to the back. I will work on that solution myself but I think it would be needed especially if a pedal drive would ever come about to the ATAK. - Speaking of the Pedal Drive, the announcement that the pedal drive "might not be compatible" with the ATAK the day after I ordered, is the single biggest problem with this boat. I fish "motor- less" tournaments and a pedal drive is allowed, but electric motors are not. this was disappointing to say the least. I hope they can figure out a pedal solution to this boat..because it is what the people need for these types of tournaments. - The FlexPod. I am a little confused about this one. You have no way of opening the FlexPod unless you unlatch it and unscrew it. I wish the design allowed for opening of the pod while it was still latched in. I just find that one perplexing. I haven't added electronics yet, so I just use it for storage, and that is why it has an annoying design. -The paddle holder is a lil farther back than I would have liked... but now I am just being picky. Bottom Line: Overall, I love the ATAK, but it is not without some issues. If WS comes up with the pedal system, they will have a contender to beat out the Hobies, but if not, anyone who buys an ATAK, will wish, like I do, that they got a Hobie instead. I purchased my ATAK in June. I've used it for fishing in the ocean, bays, lakes, and rivers. In almost each situation, I feel that there are significant compromises in the boat design. 1- This is rather heavy kayak. Unless you're really creative, you will need a trailer to load/unload the boat. Otherwise, take a buddy. 2- Maneuverability in moving river water is marginal. Granted, the boat not designed for this type of water but with the weight and lack of maneuverability, I'd avoid any circumstance with moderate to fast moving water. 3- Regardless of how I adapt my paddling, the boat constantly turns right. Another reviewer found the same issue. 4- The seat slides are awful. Move the seat to the desired location and plan to leave it there. You're not moving it while the boat is in use. 5- All closed hatches leak, including the center console which is designed for battery and electronic storage. I've spent a lot of time trying to make mine seal adequately but it's not happening. I was forced to design a separate battery box and mounted my fish finder on a Scotty mount with over the side transducer. One big reason for buying this boat was to avoid this issue. Very disappointing. 6- I wouldn't rate the boat as unstable but this boat is nowhere near a Hobie Pro Angler for stability. If I keep the boat, I'll add outriggers for standing. 7- As previously mentioned, this boat comes with Zero accessories. I had to drill and cut openings for flush mount rod holders and other rail mount accessories. Were it not for my fishing crate, accessible storage would be very limited. 8- Wilderness Systems has performed poorly in releasing accessories for this boat. The fact that it's August '15 and there's still no rudder available, in my opinion, is unacceptable. If I continue to use this kayak, I'll add an electric tolling motor. I'd much prefer a pedal system but I cannot foresee WS having this available in a reasonable time- frame. Maybe I set my expectations too high but this kayak has significantly under-performed. I was expecting this to be the pinnacle of kayak fishing but that's not the case. This kayak is nice but I agree with other reviewers. First the flexpod is no where near watertight one trip on Lake Ontario and I had to dump out all the water so I wouldn't ruin my battery. Next I had to add flush mount rod holders for this price point I feel I shouldn't have to cut into my yak. Also my front compartment is not watertight when waves crashing on you I think they mean watertight when fishing in the rain. Other than that still great yak very stable I love being able to stand up and stretch and also seat is extremely comfortable so that's why giving 4 stars because there are some things ws has to work on but I'm looking forward to pedal system. The ATAK is a big kayak and can be quite a handful on windy days. I hope WS gets the rudder kit on the market soon, I really miss the control for drifts on windy days. One of the clips that holds the pod in place fell off the second time I used the kayak, a little disappointing after spending so much on the kayak. This kayak is beast to move on land, so if you are planning to cartop it will be a handful. It is better suited for a trailer. Again, I hope WS comes out with the promised accessories, soon! This boat is amazing. Ive got a few different yaks, and this summer purchased a new 2015 OK trident and a ATAK....Ive taken the atak for the last three days, putting it through its paces, and I have to say. What a boat! So haven't had this for a terribly long time, but enough to post an honest review on it. The pros are pretty well documented. It's a long, stable, kayak with a great seat and virtually unlimited customizability. It's stable enough I feel comfortable fly fishing from the deck, and had no problem supping down rivers, sitting back down for any rapids above class 1+. Did class 3 with my daughter on the boat as well. It's definitely work to turn in tight situations but it's obviously not made for technical rivers and excels in slow rivers and open water. By far the lowest riding kayak I've used. Virtually unaffected by cross winds even without a rudder. Looks amazing, and paddles much faster than the weight would suggest. Get a long paddle for this one as well 260cm and up. Much wider than it seems especially with the seat in the raised position. There are however enough cons for me to easily deduct a star, and seriously considered deducting 2 stars. First off, it's an expensive boat. At the top end of what one could conceivable expect to pay for a boat with the features. Unfortunately with the high cost, you really don't get anything included with it. No rod holders, rudder, skeg, anchor, wheels, scupper plugs, nothing. So, expect to pay another $200 - $500 to outfit this as a proper fishing kayak, not counting motors, fish finders, the stand up seat, etc. Second, there is virtually no accessories available. The stand up seat is available, but replacement parts and the 2015 rudder kit is not. We're half way through 2015 and so far there's no way to repair any ATAK proprietary part, which there's a number of, and no factory rudder option. One example, I somehow sheared off one of the seat bolts sitting in open water, 10 minutes into my first trip, not even leaning back in the seat. I'm 160 lbs and this shouldn't even be possible. It's possible that I got a defective bolt, but if not, have a plan to replace the seat bolts, which by the way are not available so you're going to have to rig your own. Standard 1/4 - 20 threaded just FYI. Third, not water tight and not well draining areas. While this is to be expected of main compartments, what I wasn't expecting is the FlexPod console isn't the slightest bit watertight and it's made for housing electronics... There's no way to drain the cup holder area, so expect it to be full of water if paddling in the ocean or a river. This is just baffling why they wouldn't allow it to drain to the main deck. I also don't have the slightest idea how to make the flexpod water tight. Again, maybe I got a defective one, but I wouldn't store my wallet in here let alone some expensive electronics. Surprisingly the watertight deck storage was actually watertight. Lastly, storage. It doesn't store near as much as I would have liked it to. Front hatch can hold a small volume and besides the crate space behind the seat, there's virtually no other storage space unless you're just planning on strapping it to the front and rear decks above the existing storage hatches. A 550 lb capacity kayak should be able to carry way more gear than what it does. Going to have to get really creative when we do multi day trips with this boat. In conclusion, I would give the boat itself 5 stars, but I'm giving 3 for the overall value which would include out of the box and available accessories and what I would consider some engineering problems that should have been addressed early in the development cycle. Going to get really aggravating if WS can't get ATAK parts available especially the defective ones like my seat bolts. This kayak has a ton of potential, may end up being one of the best fishing kayaks ever made, but there are design issues that shouldn't ever have made it into a production release of this kayak. like the yAKAATTAK lot of room. only complaint is when I have my dog or grand child on board the yak tends to turn right alot. almost like paddling a canoe not a yak. Lots of space, electronics work well in the compartment. Pros: - Extremely stable, can stand up and turn a full 360 degrees once your used to it. - Packs your gear inside the ATAK for easy storage and transportation. - Tracks very straight and moves quickly through the water. - Super comfortable seat, adjustable in three positions and can slide forward. - Mounting tracks every where for maximum customizing. - Excellent storage capacity. Cons: - Turnability is low. - The seat easily gets jammed when trying to adjust it's position along the tracks it's attached to. - The side handles are just holes inset into the side of the hull and difficult to grip, pretty much pointless. -The seat is not quickly reattached after removing it. It seams to me that with a premium product like the ATAK, more thought would have been invested into quick seat removal and reattachment. - The front edge of the Flex Pod scupper hole easily hangs up on things, I noticed right out of the shipping truck that mine had caught on something during transportation, the damage didn't compromise the hull, but it was clearly dinged by something. Wrap Up: Over all I still give this product 5 stars. I do very much like the ATAK, I take mine out every chance I get. I do think more thought needs to be put into the way the seat is mounted. With what I paid I expect a premium product. This is Wilderness Systems top of the line, it needs to perform like it. I want a smooth sliding seat track and quicker removal and reattachment of the seat. I want some sort of added protection to the Flex Pod scupper hole during shipping and handling. Preordered this boat after talking with a very helpful rep from Wilderness Systems, and the wait was worth it ! This is definitely a bigger boat than my Ride 115, and the advantages and features on the ATAK are obvious the first time on the water. This boat is a very stable platform that paddles so well with speed and comfort, not to mention how well the new Air Pro Max seat works in this boat. Hats off to Wilderness for working out the kinks with their pro staff before releasing this boat, the results are amazing and have to be experienced first hand to fully appreciate all that this boat offers. I had previously fished alot out of my Ride 115, and never felt that I was under gunned wherever I took my kayak, until I got my ATAK............ Then I realized how serious Wilderness was about delivering an incredibly well thought out fishing kayak that eclipses all the other brands. No doubt that you can by a cheaper kayak, but when someone is serious about having a kayak that comes ready to hit the water, and has everything you could hope for and need to pursue just about any type of fish, this is the only legitimate choice. Standing in the cockpit area is comfortable, stable, and certainly not cramped, and the included non slip pads for the floor are just another prime example of Wilderness Systems' expertise in addressing the real needs in a fishing kayak. The Flex Pod console works great, and I mounted a Lowrance HDI 5 Elite on it with A Ram Mount, and it provides the convenience of an all in one unit for battery, transducer, and fish finder that can be removed for transport and to eliminate the loss of an expensive unit to theft. About the only thing that could use a bit of refining is how the seat mounts inside the cockpit, it fits very tight, and might just need some customizing to make the seat frame fit smoother. Overall, this is truly the ultimate fishing kayak out there, and worth every penny. Looking forward to getting the 3D Air Pro Max seat to really set this kayak apart from the wannabes !! !